Mark R. Shinn, Ph.D. Michelle M. Shinn, Ph.D. Lisa A. Langell, M.A., S.Psy.S. 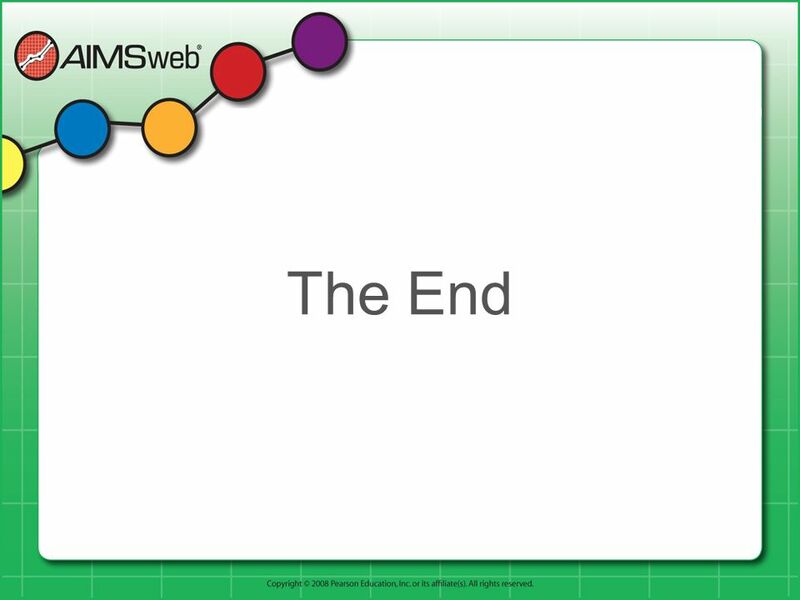 Summative Assessment: Culmination measure. 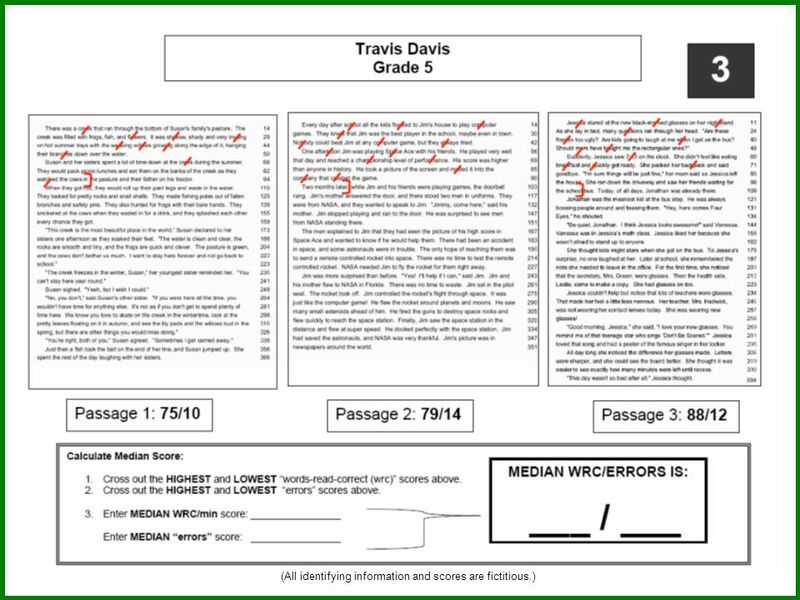 Mastery assessment. 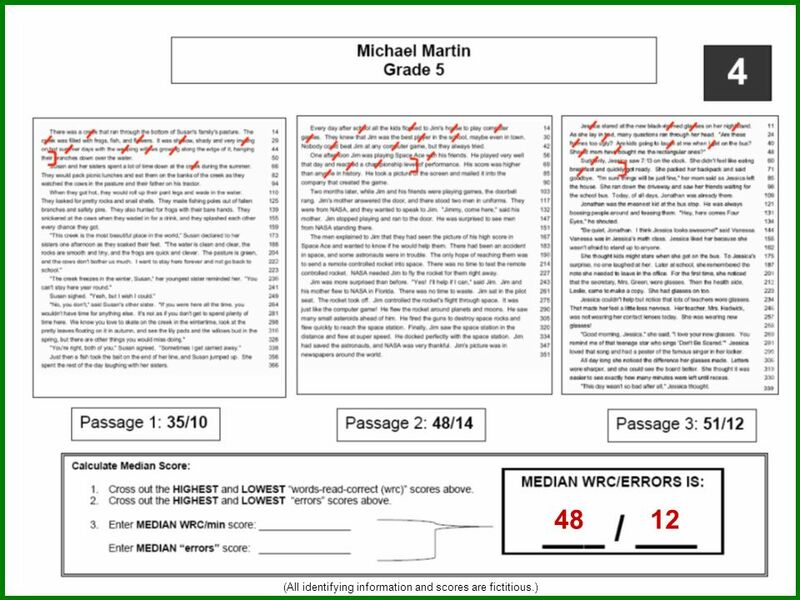 Assessment after instruction. 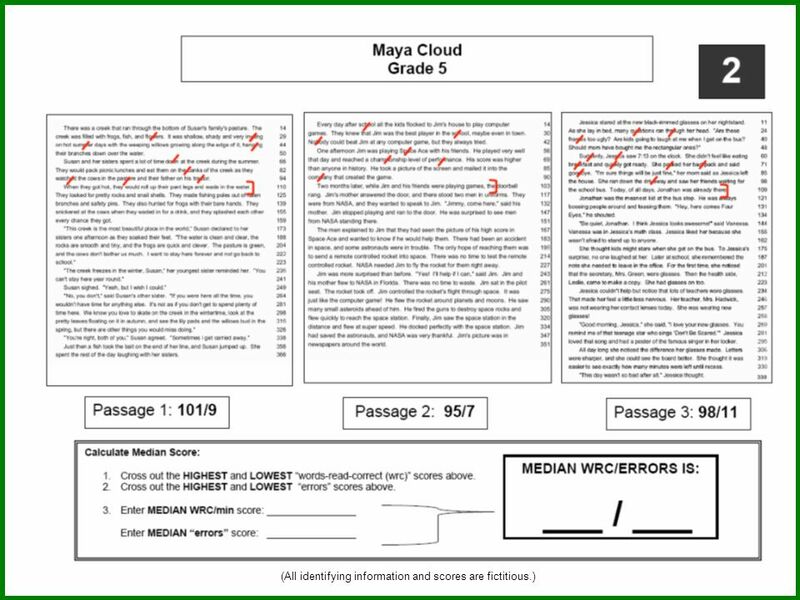 Pass/fail type assessments which summarize the knowledge students learn. 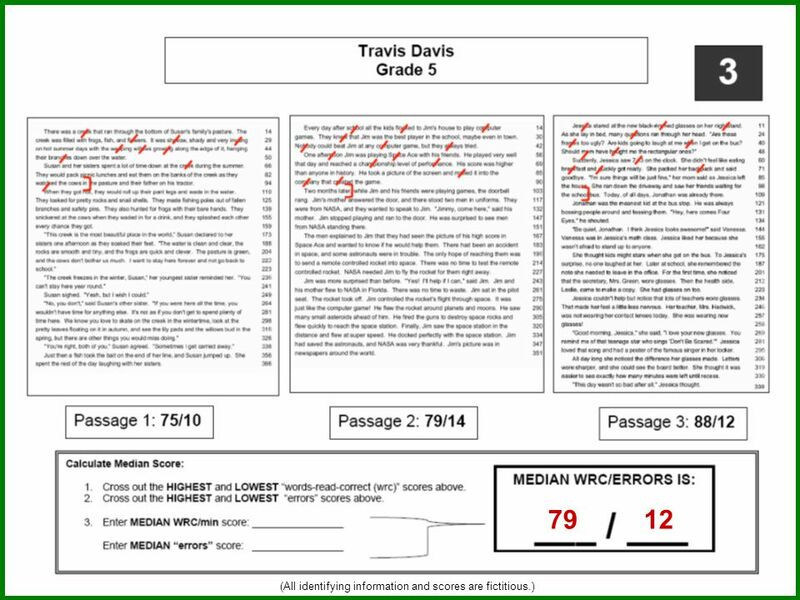 Typical summative assessments include: End of chapter tests High-stakes tests (e.g., State assessments) GRE, ACT, SAT, GMAT, etc. tests Driver’s license test Final Exams. 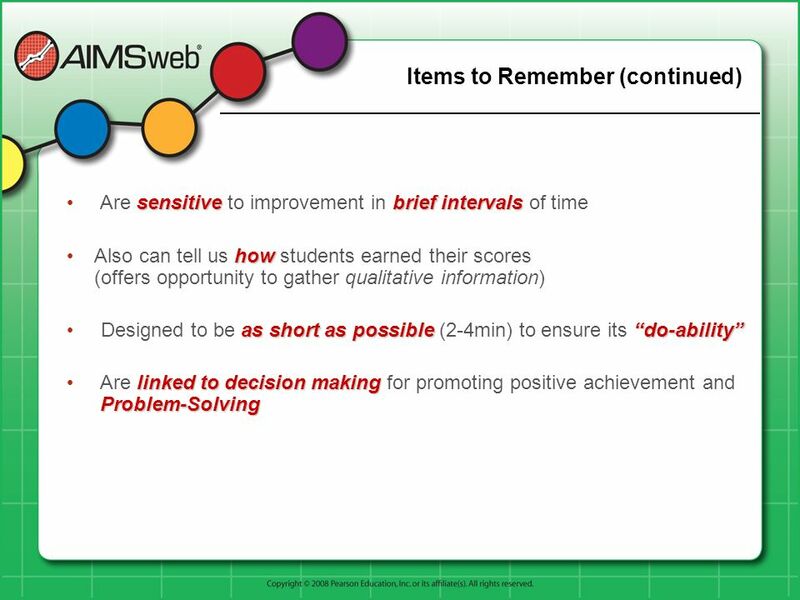 Formative Assessment: Process of assessing student achievement frequently during instruction to determine whether an instructional program is effective for individual students. 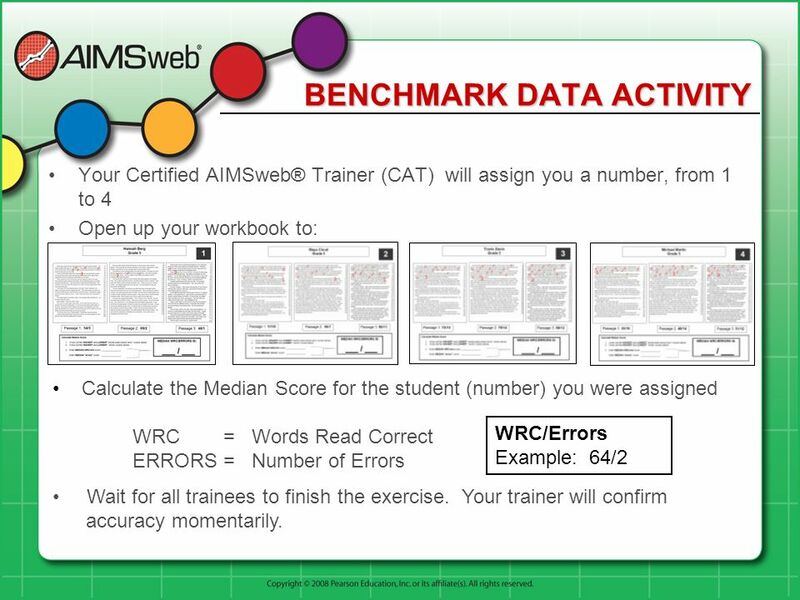 Informs: When students are progressing, continue using your instructional programs. 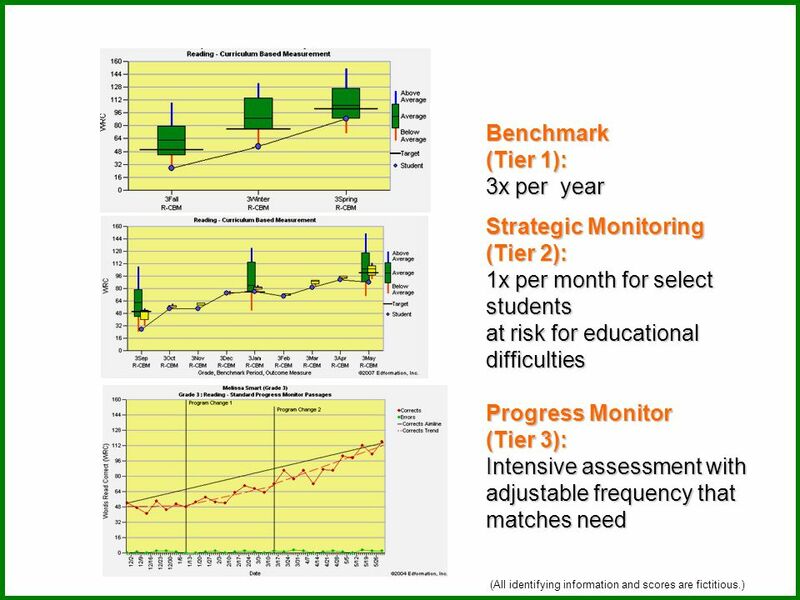 When tests show that students are not progressing, you can change your instructional programs in meaningful ways. 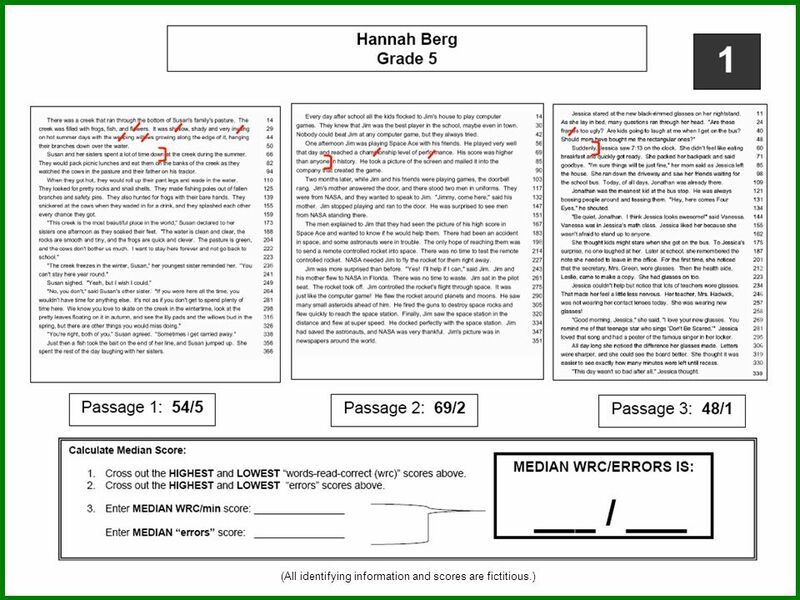 Summative Assessment: Characterized as assessment of learning. 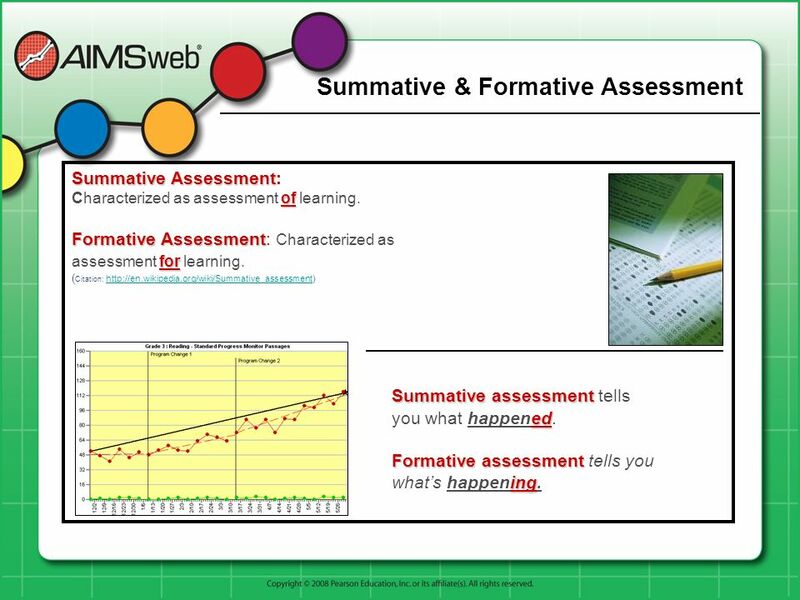 Formative Assessment: Characterized as assessment for learning. 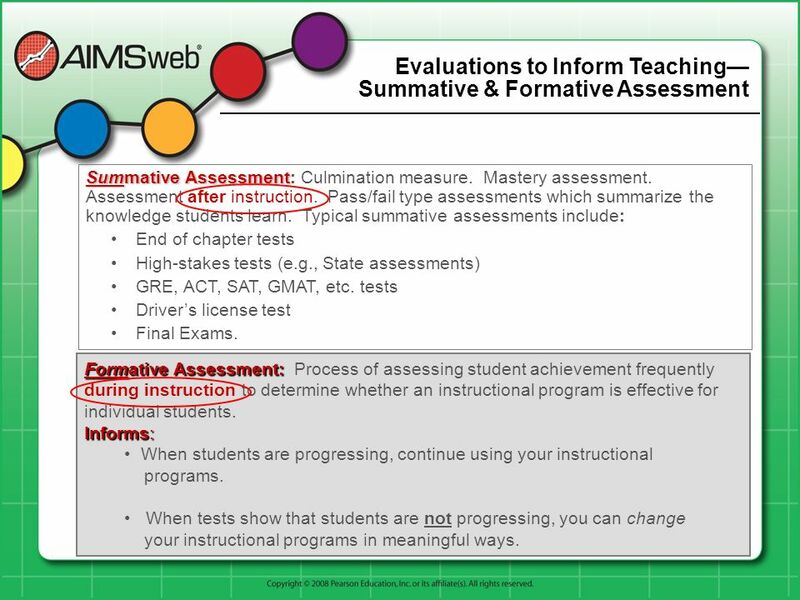 (Citation: Summative assessment tells you what happened Formative assessment tells you what’s happening. 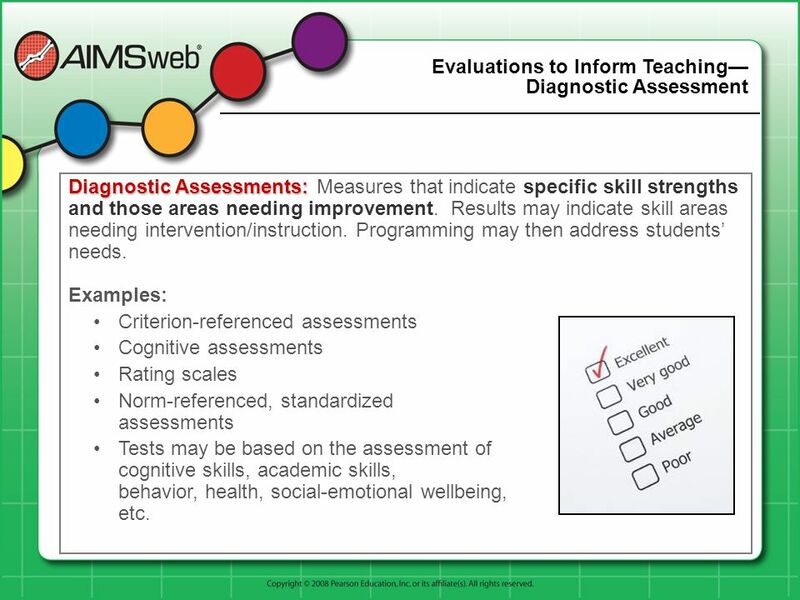 Diagnostic Assessments: Measures that indicate specific skill strengths and those areas needing improvement. 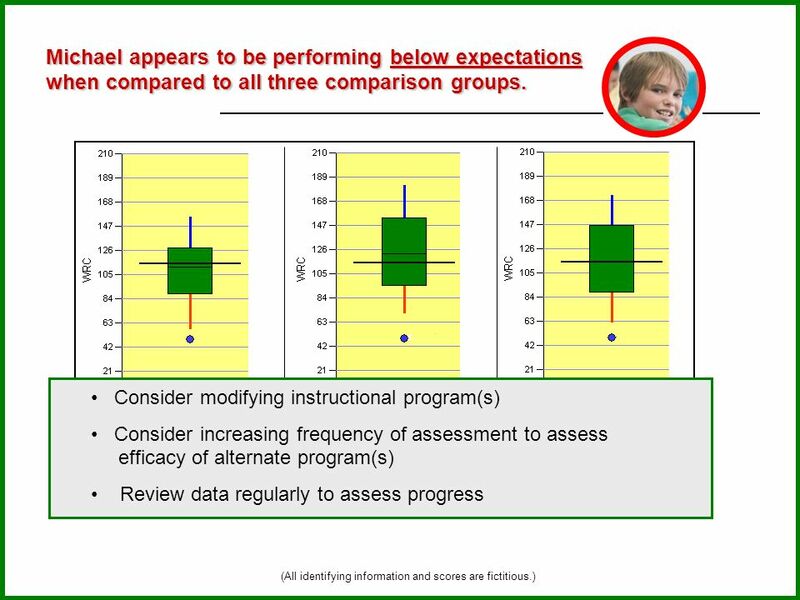 Results may indicate skill areas needing intervention/instruction. Programming may then address students’ needs. Examples: Criterion-referenced assessments Cognitive assessments Rating scales Norm-referenced, standardized assessments Tests may be based on the assessment of cognitive skills, academic skills, behavior, health, social-emotional wellbeing, etc. 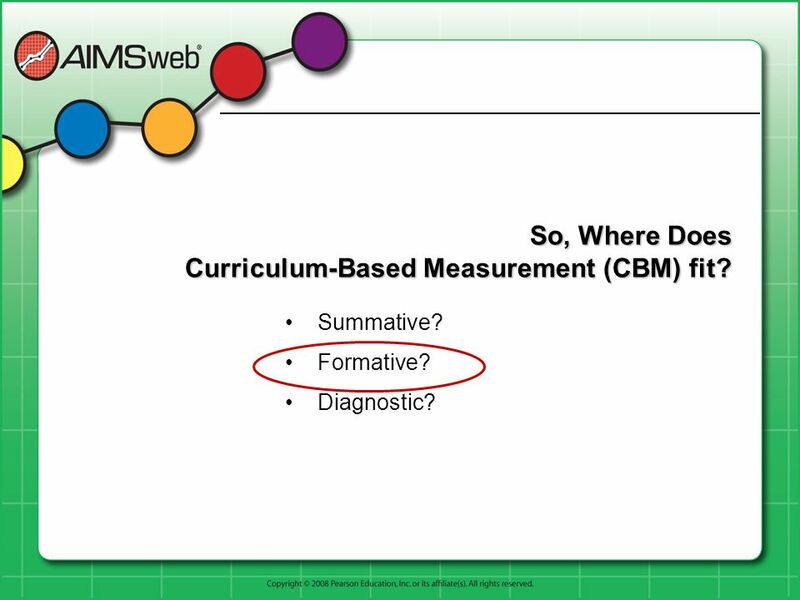 6 So, Where Does Curriculum-Based Measurement (CBM) fit? 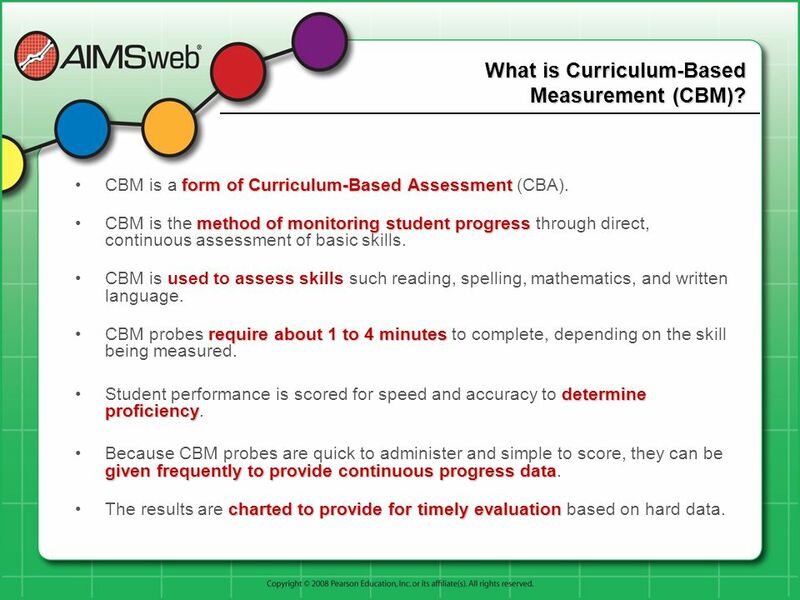 7 What is Curriculum-Based Measurement (CBM)? 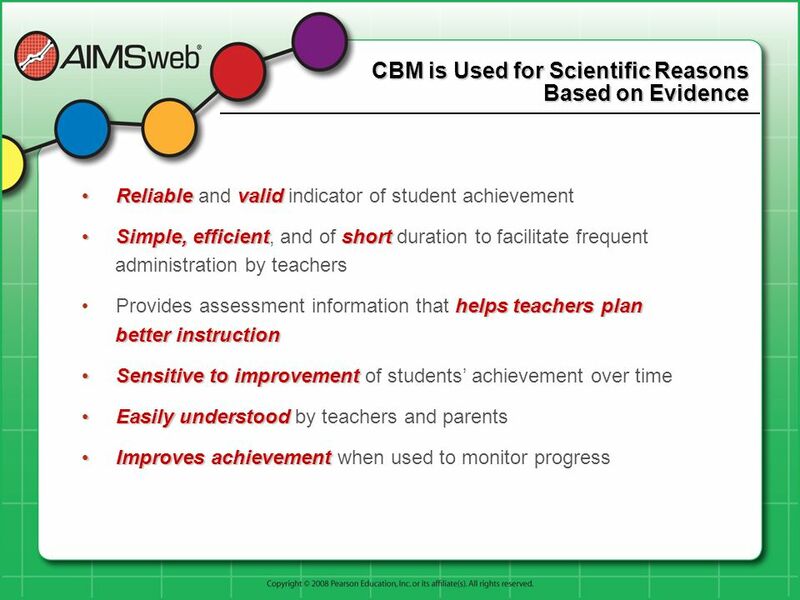 CBM is a form of Curriculum-Based Assessment (CBA). 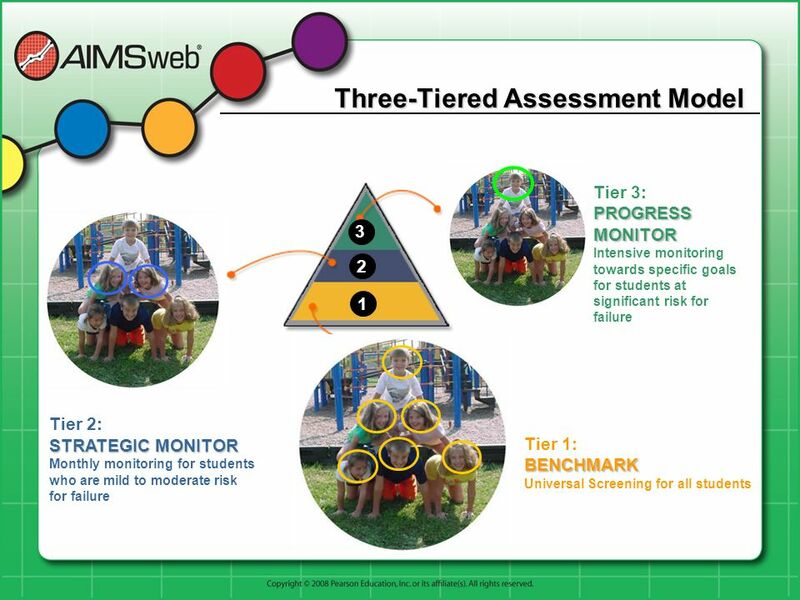 CBM is the method of monitoring student progress through direct, continuous assessment of basic skills. 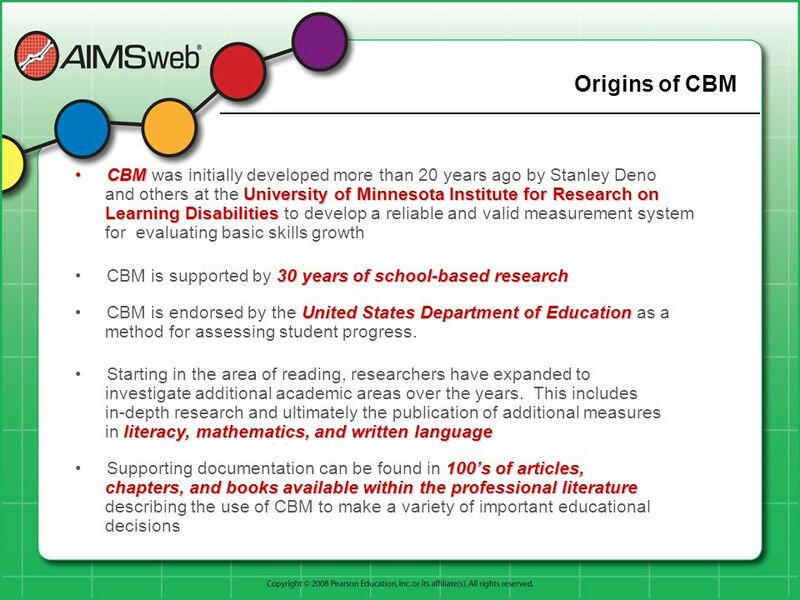 CBM is used to assess skills such reading, spelling, mathematics, and written language. 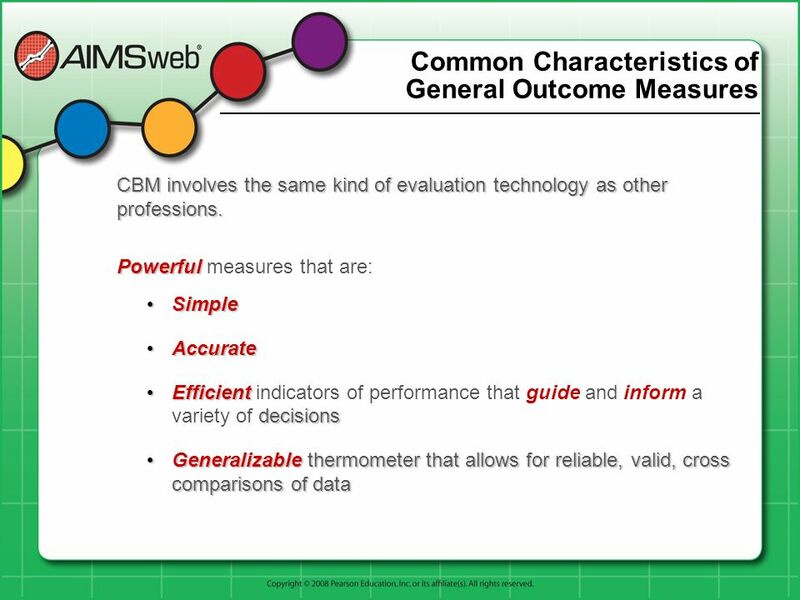 CBM probes require about 1 to 4 minutes to complete, depending on the skill being measured. 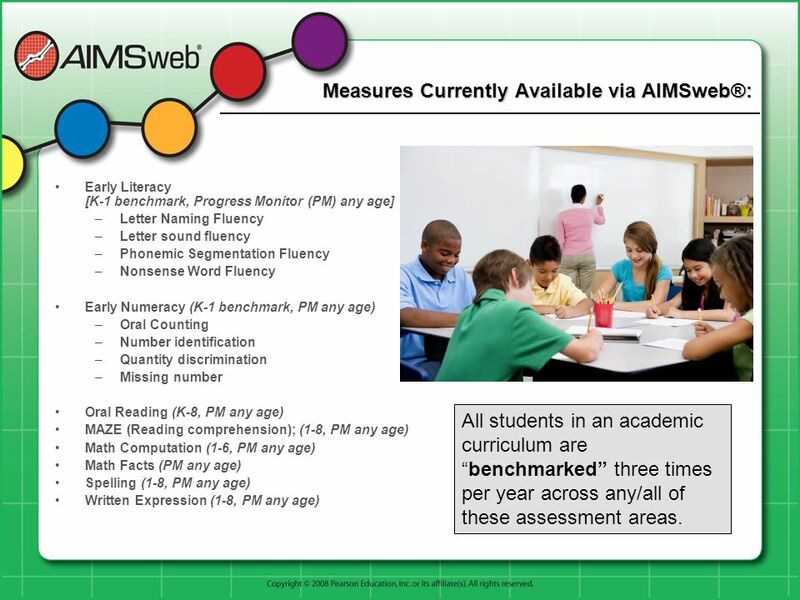 Student performance is scored for speed and accuracy to determine proficiency. 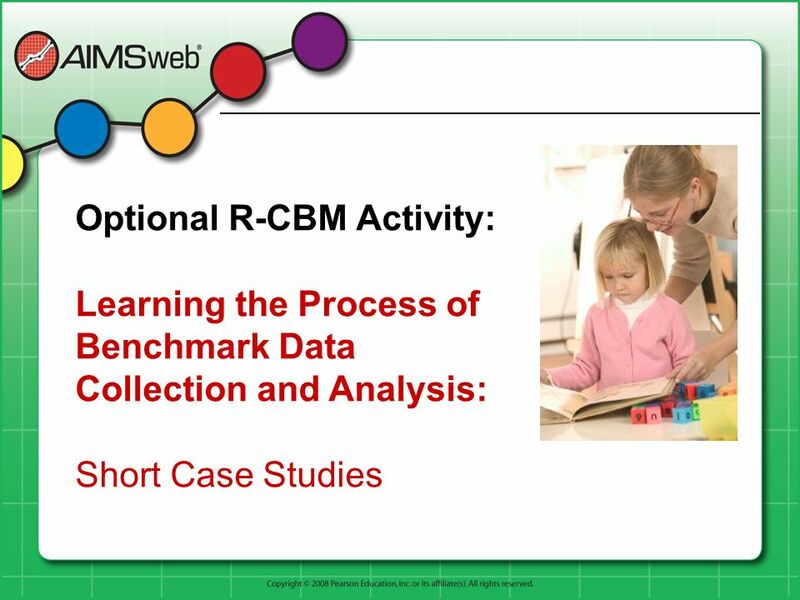 Because CBM probes are quick to administer and simple to score, they can be given frequently to provide continuous progress data. 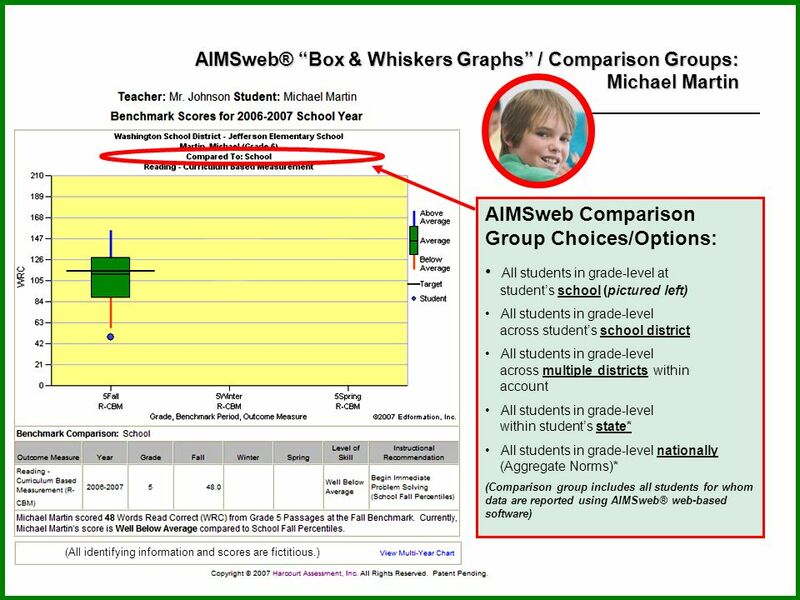 The results are charted to provide for timely evaluation based on hard data. Medicine measures height, weight, temperature, and/or blood pressure. Department of Labor measures the Consumer Price Index. Wall Street measures the Dow-Jones Industrial Average. Companies report earnings per share. 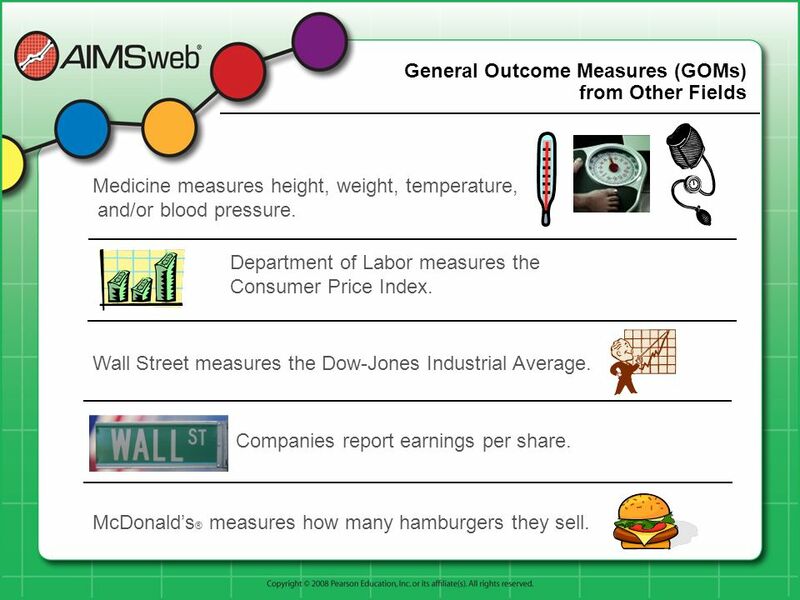 McDonald’s® measures how many hamburgers they sell. 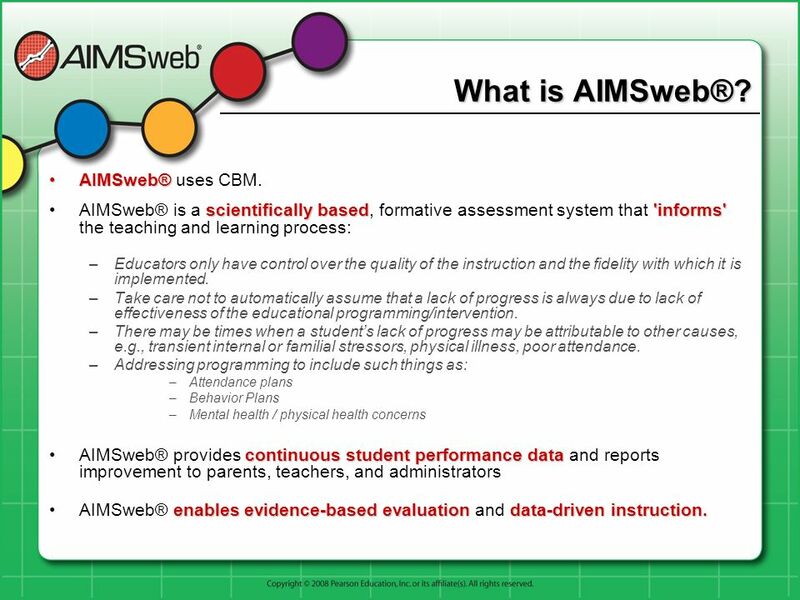 15 What is AIMSweb®? 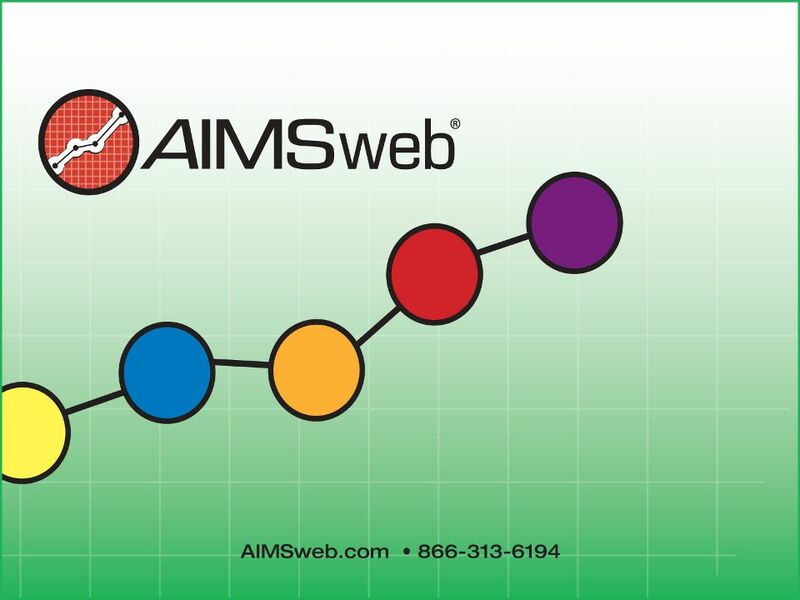 AIMSweb® uses CBM. 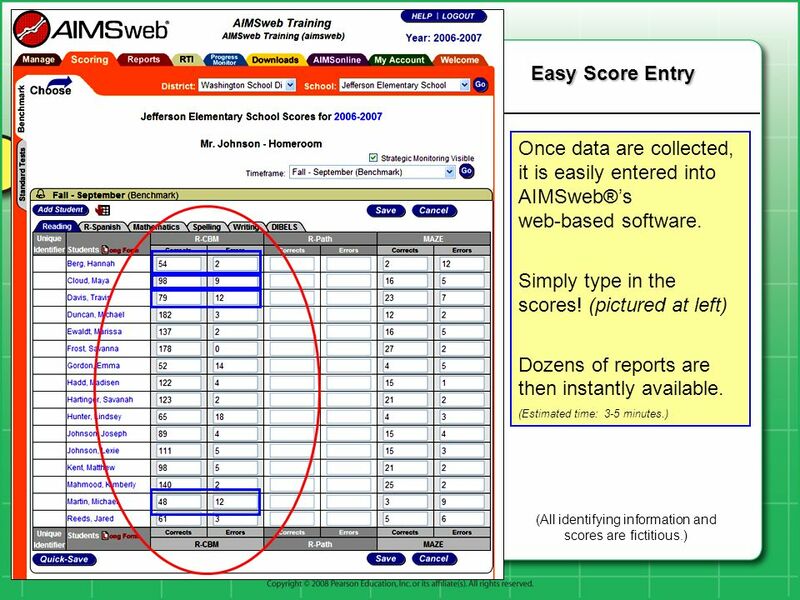 AIMSweb® is a scientifically based, formative assessment system that 'informs' the teaching and learning process: Educators only have control over the quality of the instruction and the fidelity with which it is implemented. 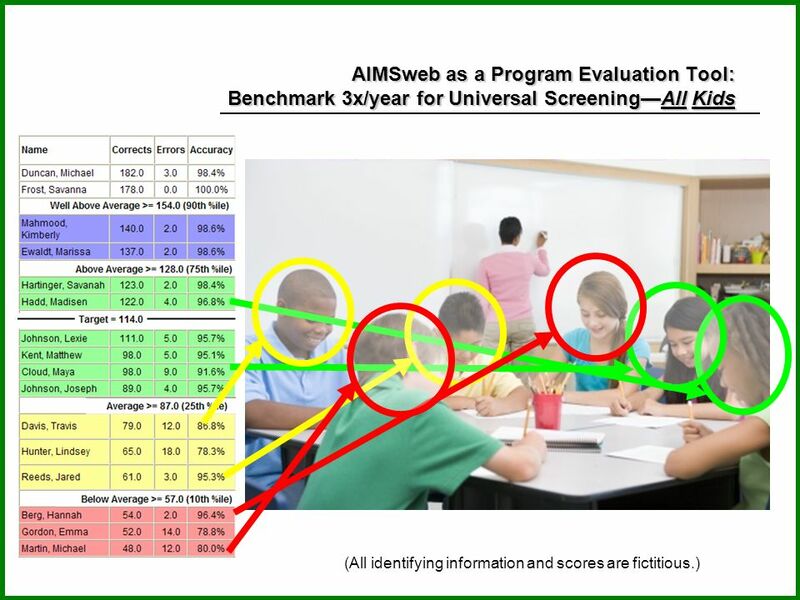 Take care not to automatically assume that a lack of progress is always due to lack of effectiveness of the educational programming/intervention. 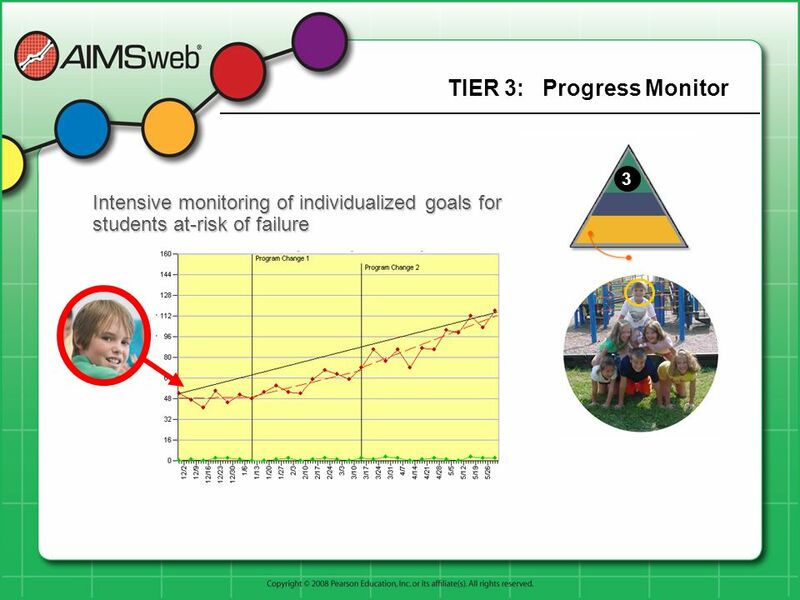 There may be times when a student’s lack of progress may be attributable to other causes, e.g., transient internal or familial stressors, physical illness, poor attendance. 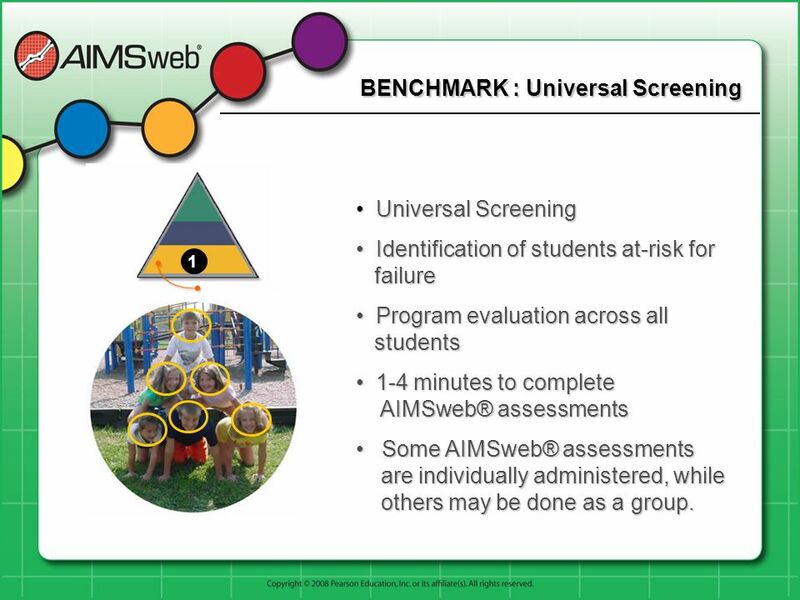 Addressing programming to include such things as: Attendance plans Behavior Plans Mental health / physical health concerns AIMSweb® provides continuous student performance data and reports improvement to parents, teachers, and administrators AIMSweb® enables evidence-based evaluation and data-driven instruction. 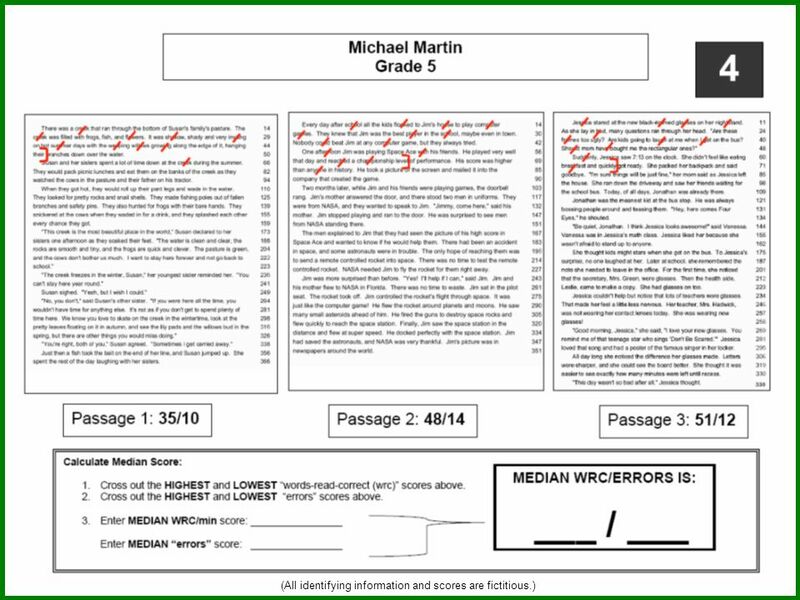 Early Literacy [K-1 benchmark, Progress Monitor (PM) any age] Letter Naming Fluency Letter sound fluency Phonemic Segmentation Fluency Nonsense Word Fluency Early Numeracy (K-1 benchmark, PM any age) Oral Counting Number identification Quantity discrimination Missing number Oral Reading (K-8, PM any age) MAZE (Reading comprehension); (1-8, PM any age) Math Computation (1-6, PM any age) Math Facts (PM any age) Spelling (1-8, PM any age) Written Expression (1-8, PM any age) All students in an academic curriculum are “benchmarked” three times per year across any/all of these assessment areas. 67 / / / 9 1 min min min. 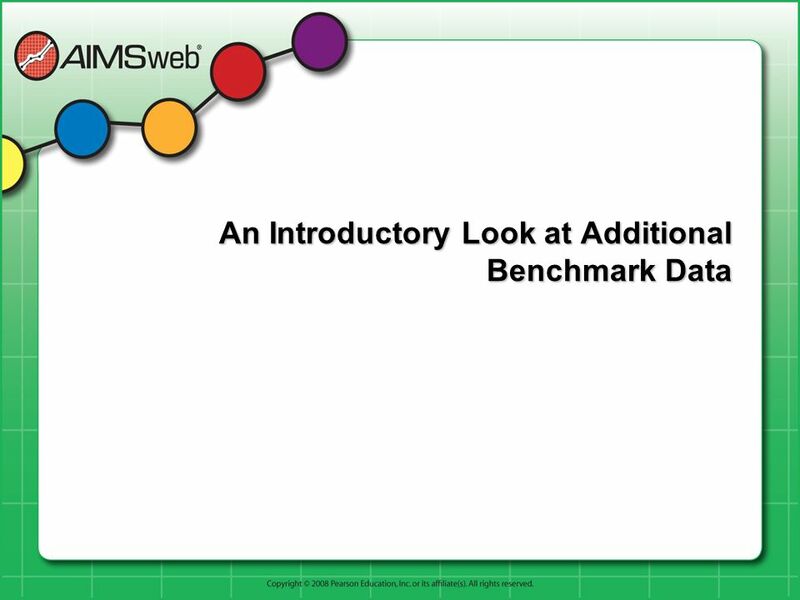 Why use Median vs. Average? 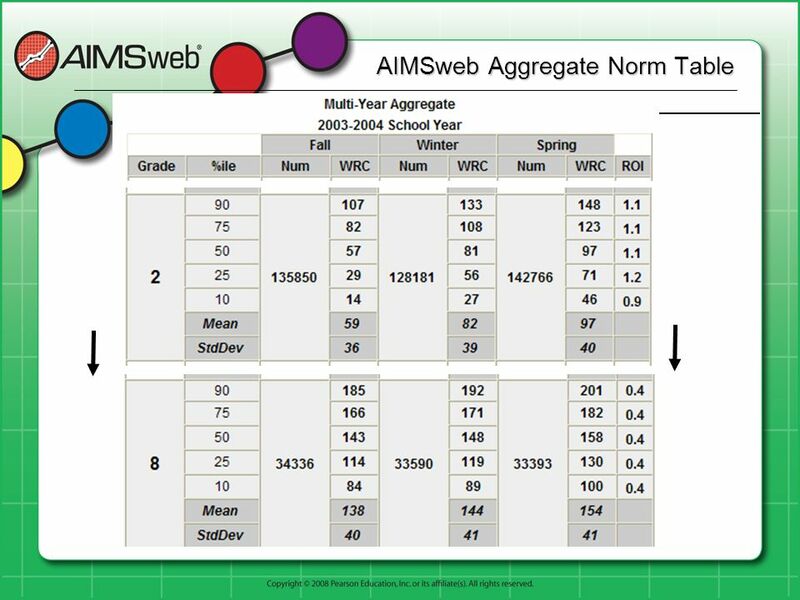 Averages are susceptible to outliers when dealing with small number sets. 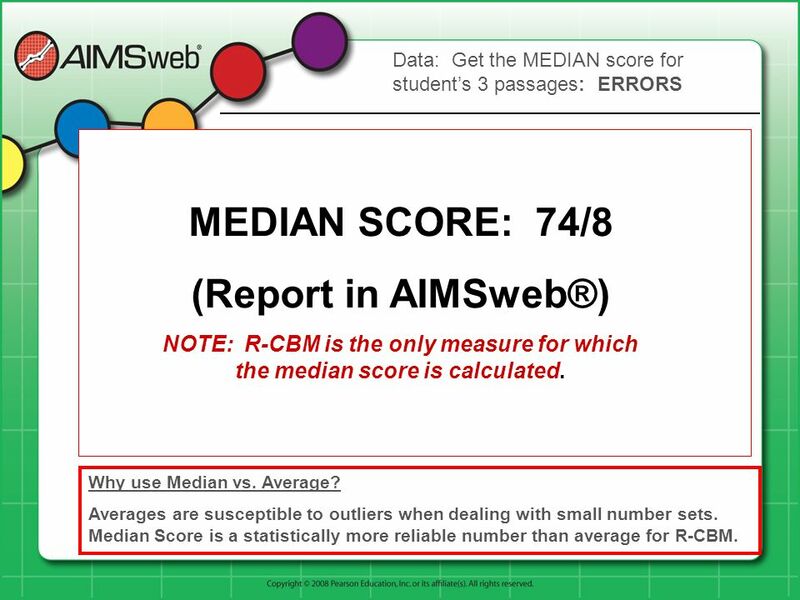 Median Score is a statistically more reliable number than average for R-CBM. Data: Get the MEDIAN score for student’s 3 passages: ERRORS 67 / / / 9 MEDIAN SCORE: 74/8 (Report in AIMSweb®) NOTE: R-CBM is the only measure for which the median score is calculated. 1 min min min. 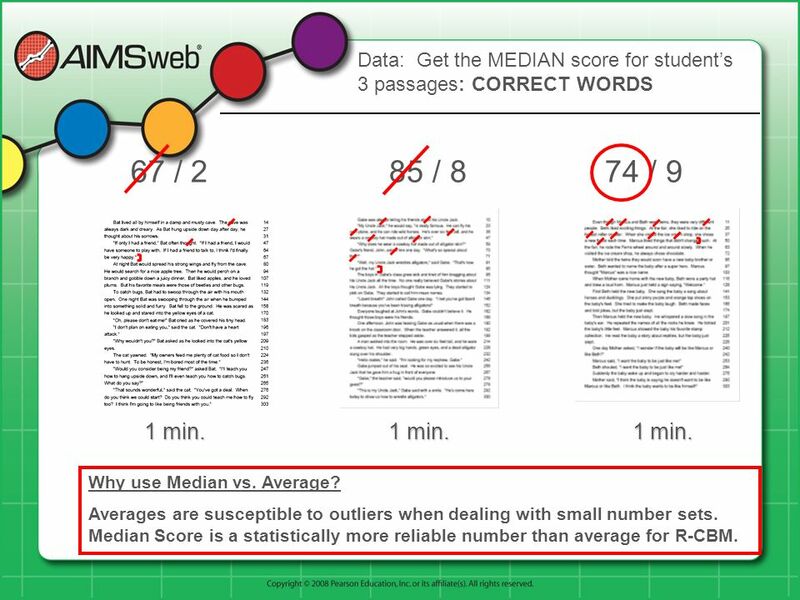 Why use Median vs. Average? 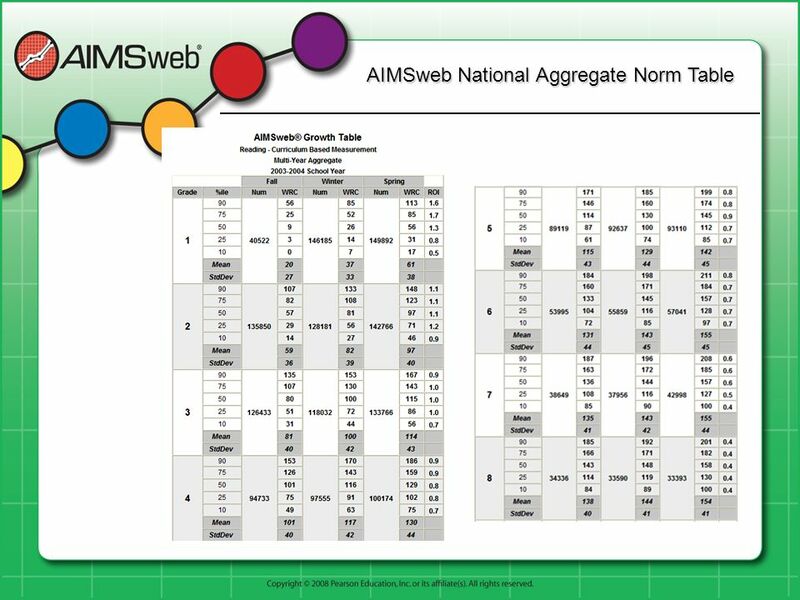 Averages are susceptible to outliers when dealing with small number sets. 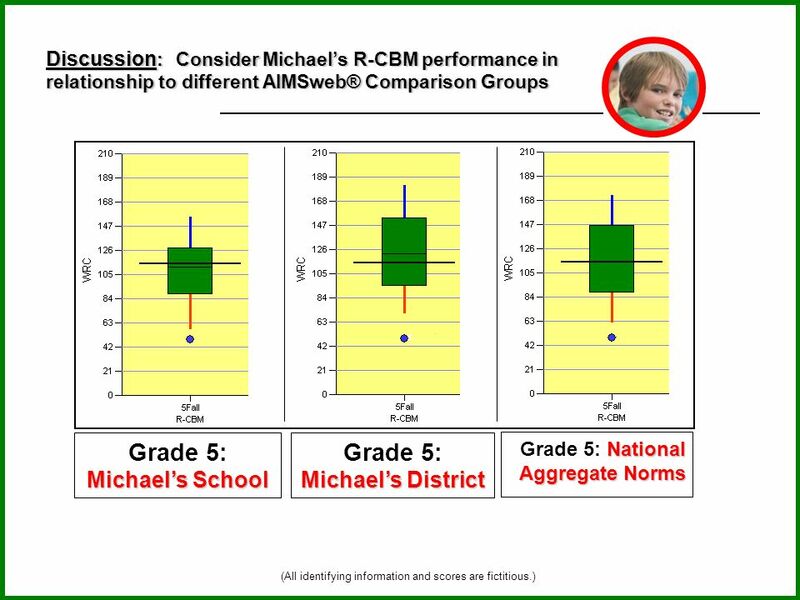 Median Score is a statistically more reliable number than average for R-CBM. 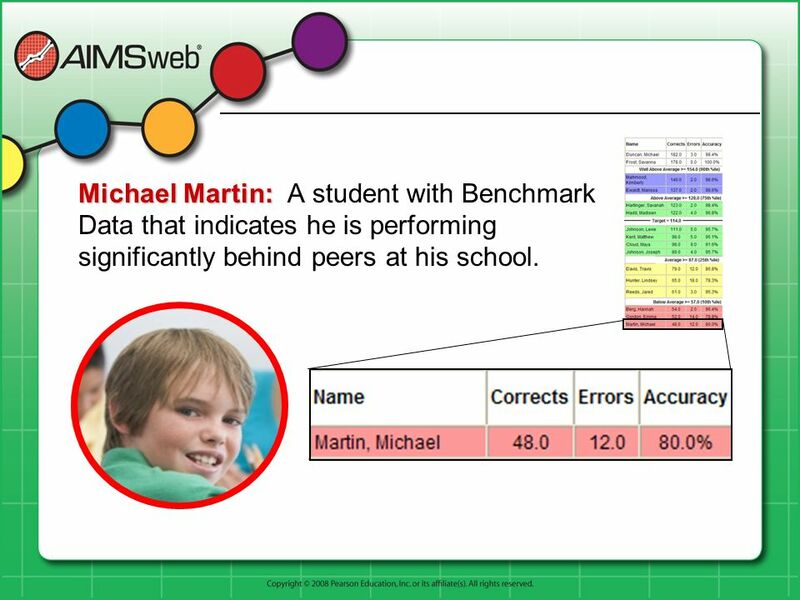 34 Michael Martin: A student with Benchmark Data that indicates he is performing significantly behind peers at his school. QUESTIONS: What does report suggest about Viviana’s progress? 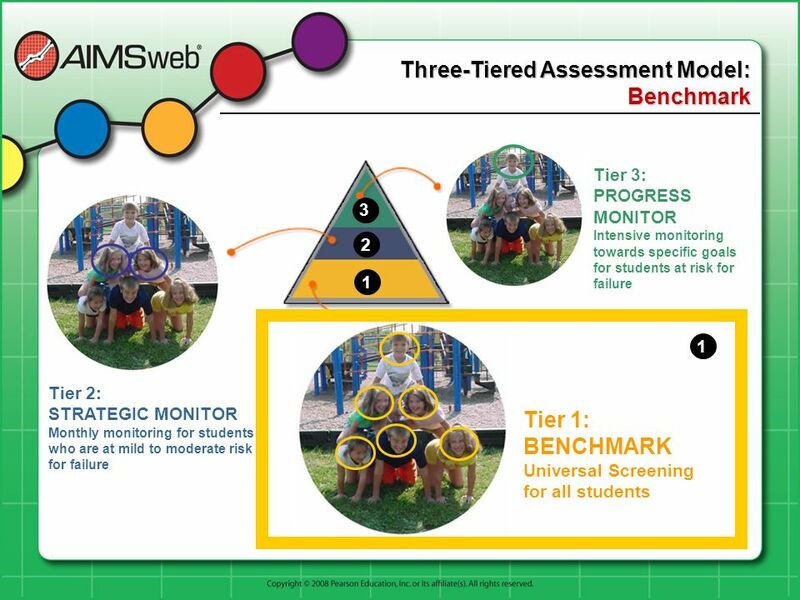 What does report suggest about the school’s progress for its 3rd grade students? 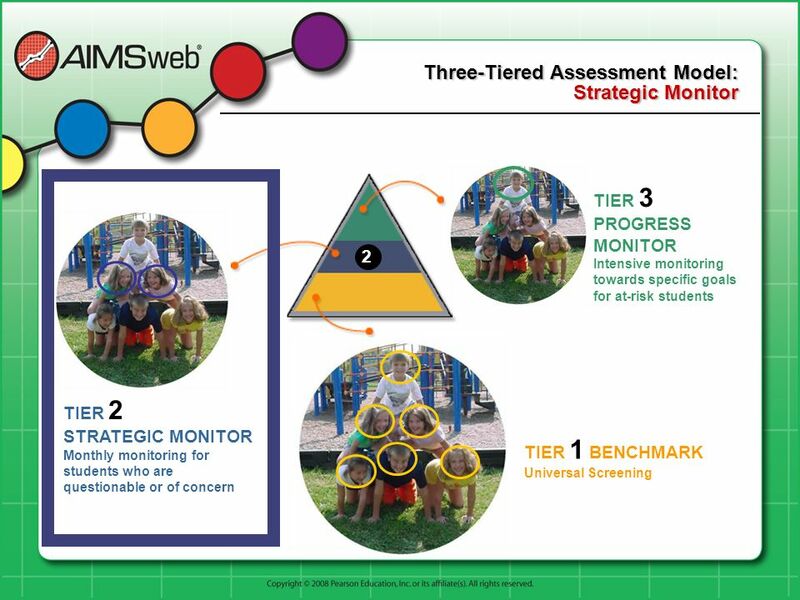 What if you saw this pattern in only one school’s 3rd grade within your district? 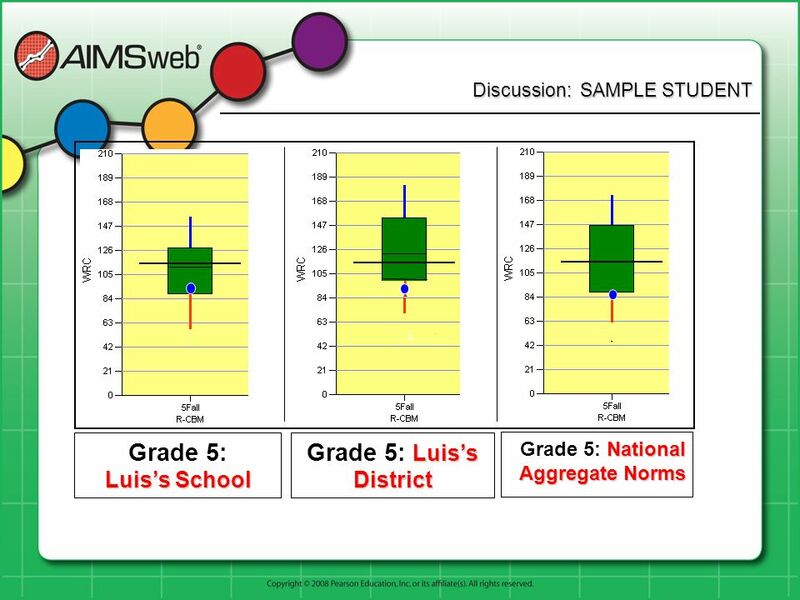 What if you saw this pattern across most or all 3rd grade groups in your district? QUESTIONS: What does report suggest about Jamie Connor’s progress? 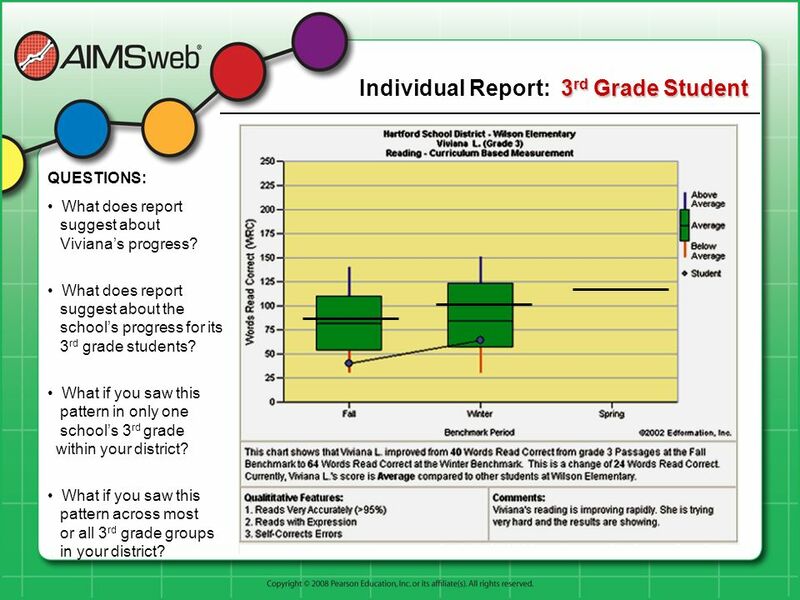 What does report suggest about the school’s progress for 3rd grade students? 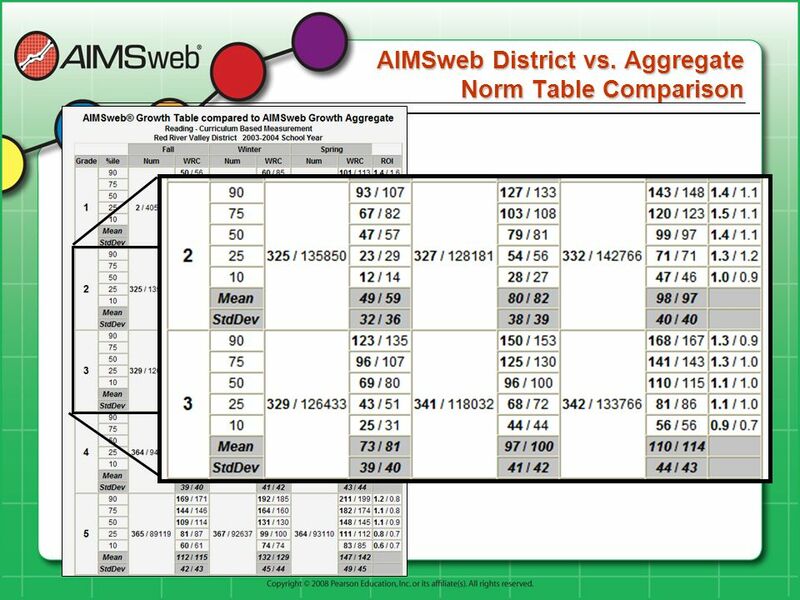 What if you saw this pattern in only one school’s 3rd grade within your district? 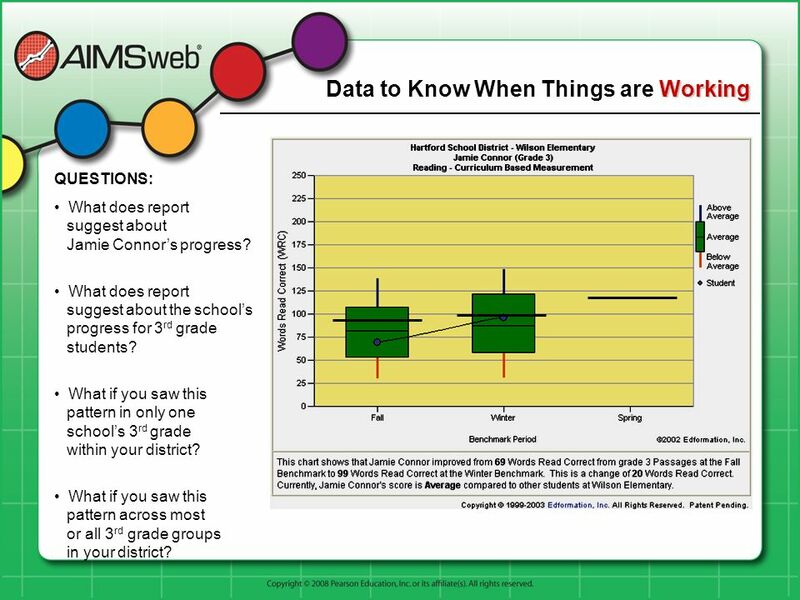 What if you saw this pattern across most or all 3rd grade groups in your district? QUESTIONS: What does report suggest about Heather A’s progress? 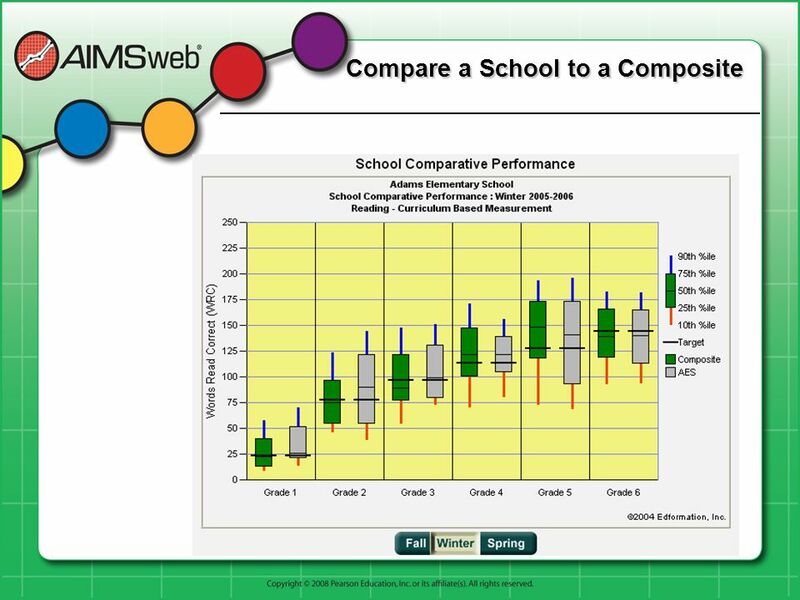 SPRING: Compared to Grade 3 peers at her school, is Heather performing in the: Well Above Average Range? Above Average Range? Average Range? Below Average Range? Well-Below Average Range? 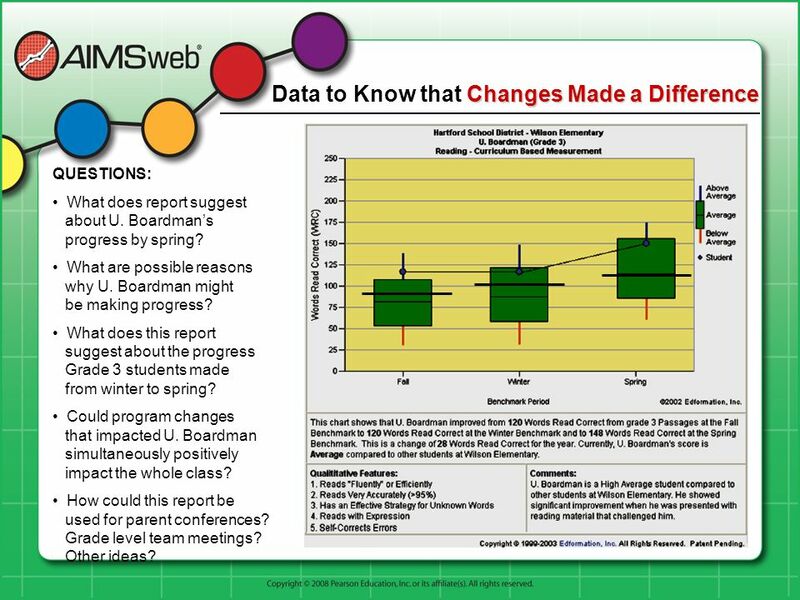 QUESTIONS: What does report suggest about U. Boardman’s progress? What are possible reasons why U. Boardman might not be making progress? 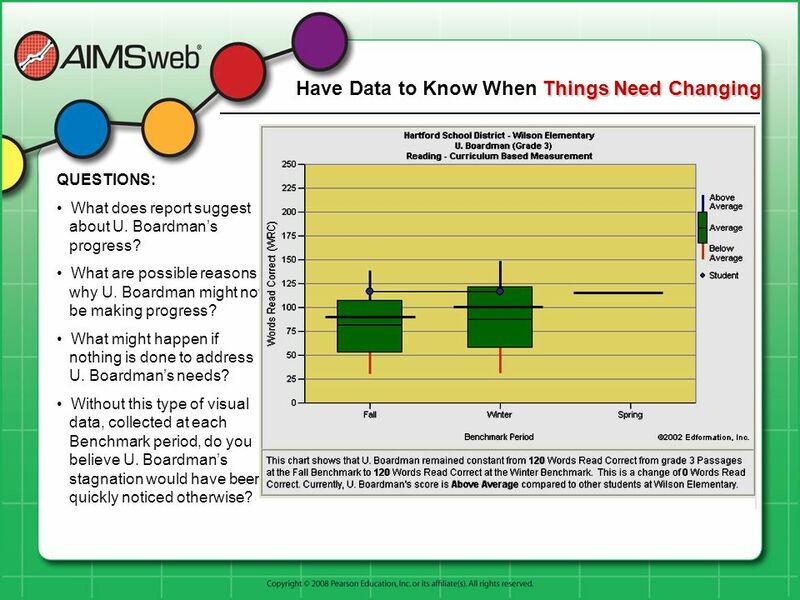 What might happen if nothing is done to address U. Boardman’s needs? 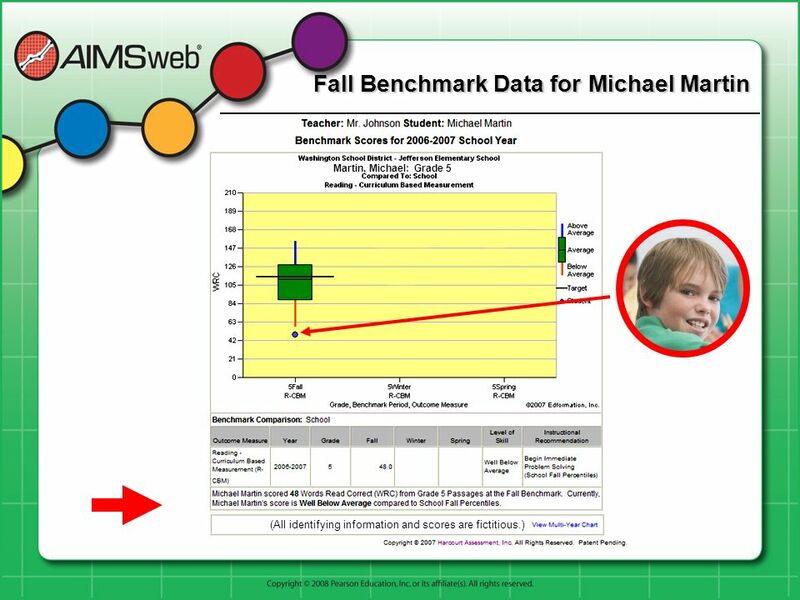 Without this type of visual data, collected at each Benchmark period, do you believe U. Boardman’s stagnation would have been quickly noticed otherwise? QUESTIONS: What does report suggest about U. Boardman’s progress by spring? What are possible reasons why U. Boardman might be making progress? What does this report suggest about the progress Grade 3 students made from winter to spring? Could program changes that impacted U. Boardman simultaneously positively impact the whole class? 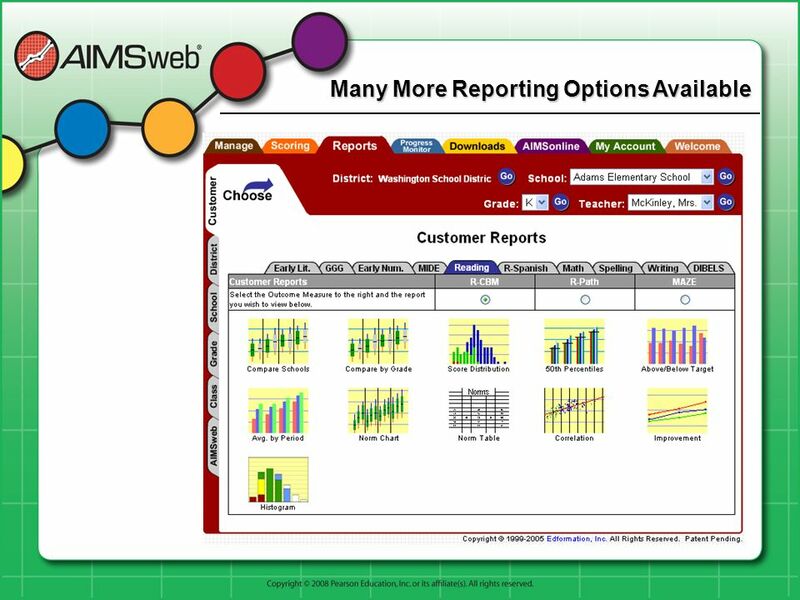 How could this report be used for parent conferences? Grade level team meetings? Other ideas? 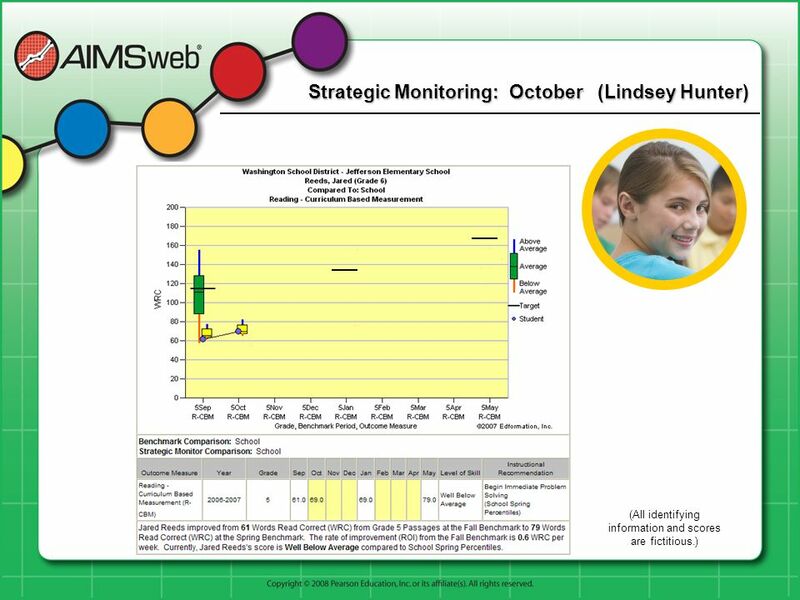 QUESTIONS: What does report suggest about Lindsey’s progress (Spring)? What are possible reasons why Lindsey might not be making progress? 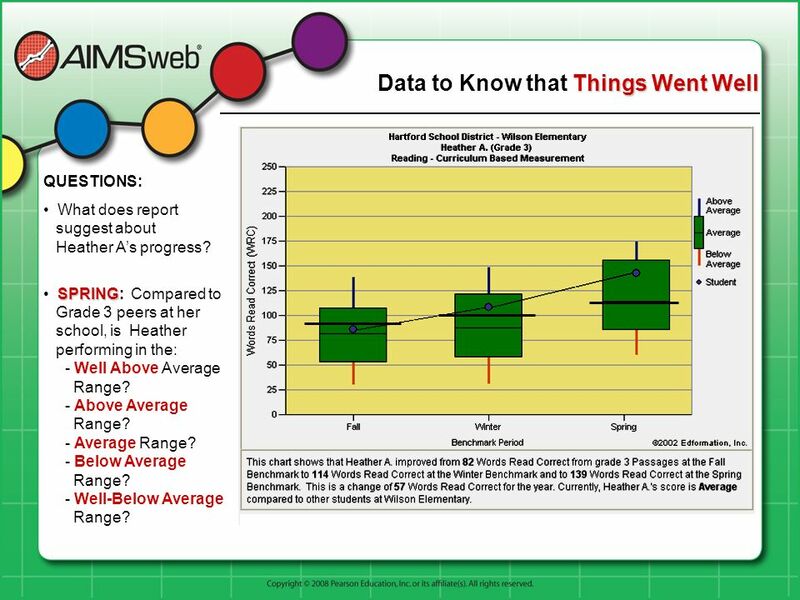 Based on this report, is Lindsey’s instruction assisting her in closing the performance discrepancy between her school’s Grade peers? How would this report be helpful if Lindsey were not currently receiving Tier 2 support? Tier 3? Special Education / Special Programs? 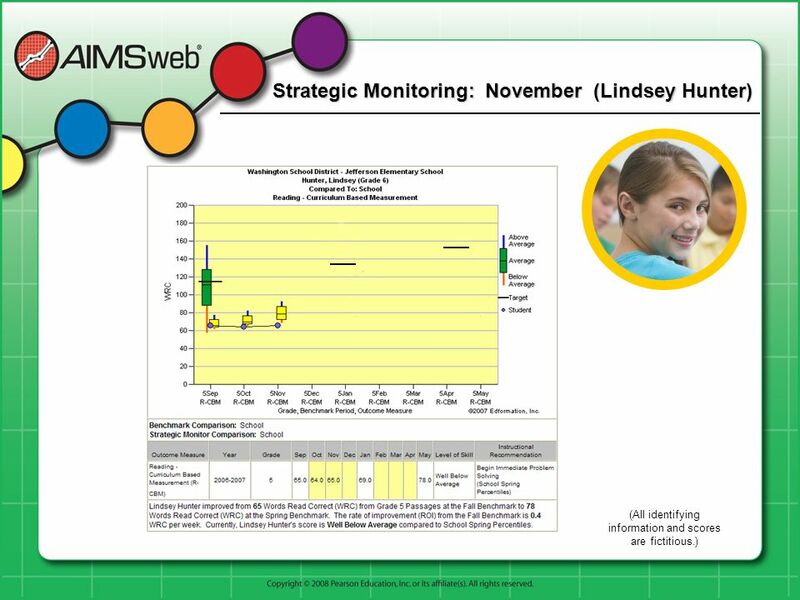 How would this report still be helpful if Lindsey was already receiving Special Education? 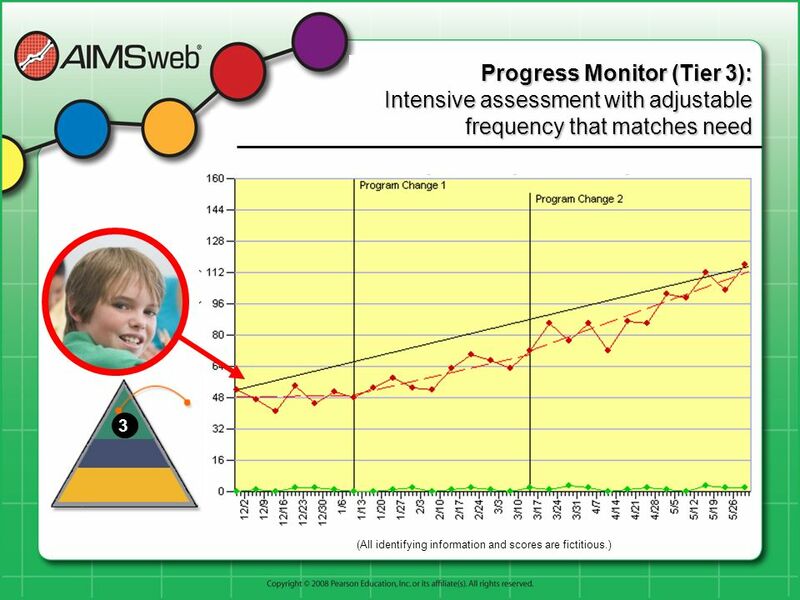 Follow student progress over time. 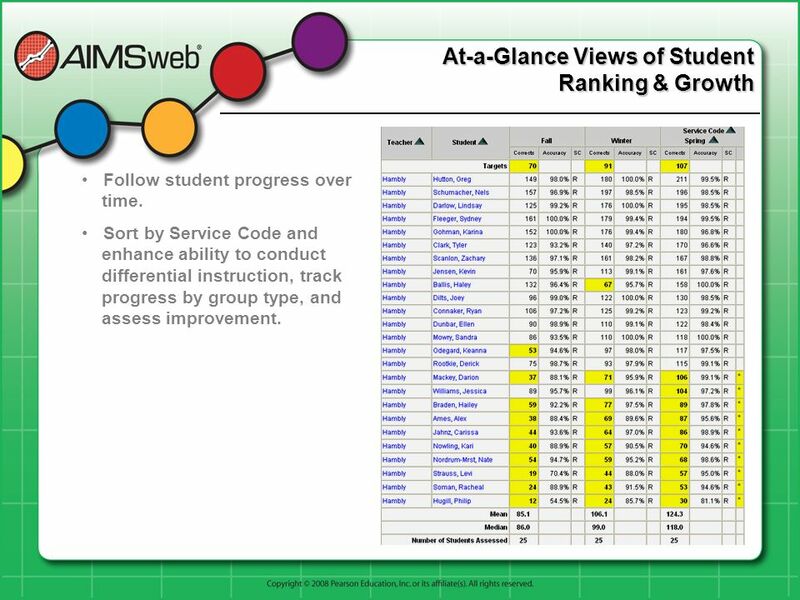 Sort by Service Code and enhance ability to conduct differential instruction, track progress by group type, and assess improvement. 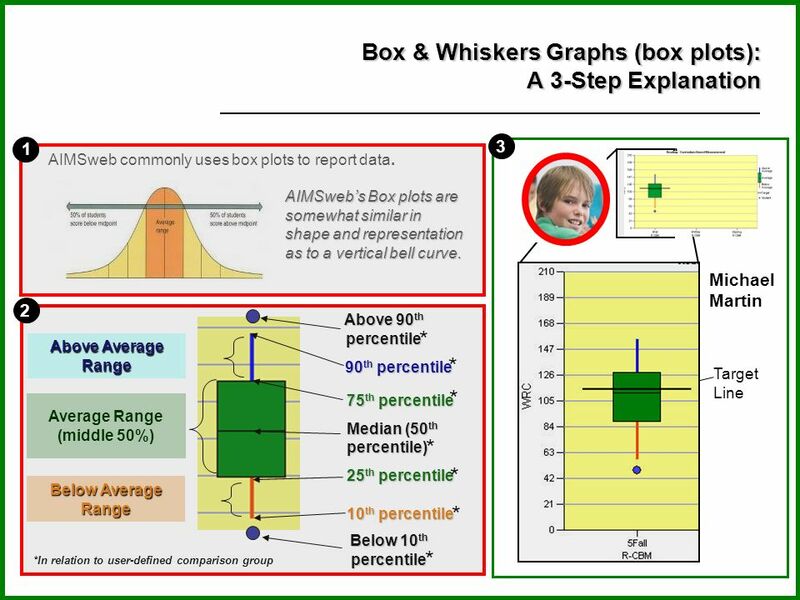 64 Finally… AIMSweb®’s Progress Monitoring and data reporting system involves testing using simple general, RESEARCHED outcome measures. 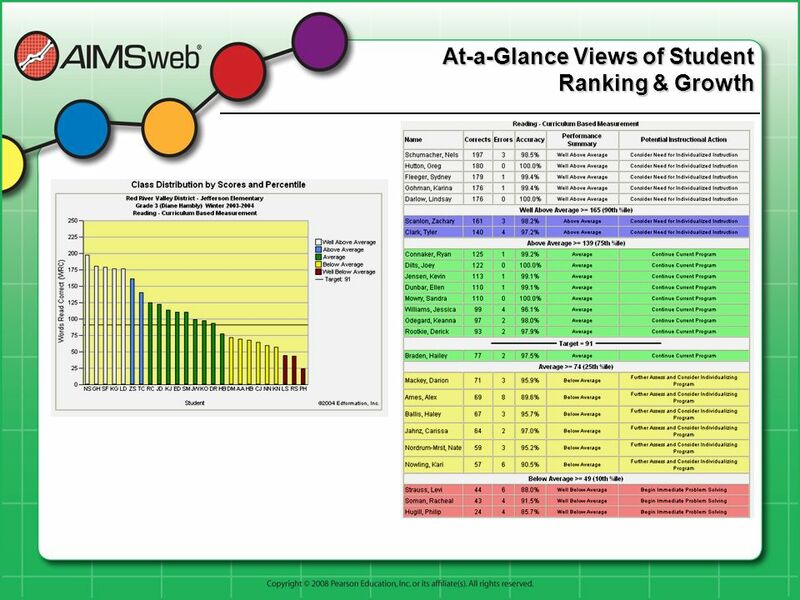 It provides an ONGOING data base that reports progress and feedback for teachers, administrators, and parents, enabling everyone to make decisions about the growth and development of students’ basic skills. 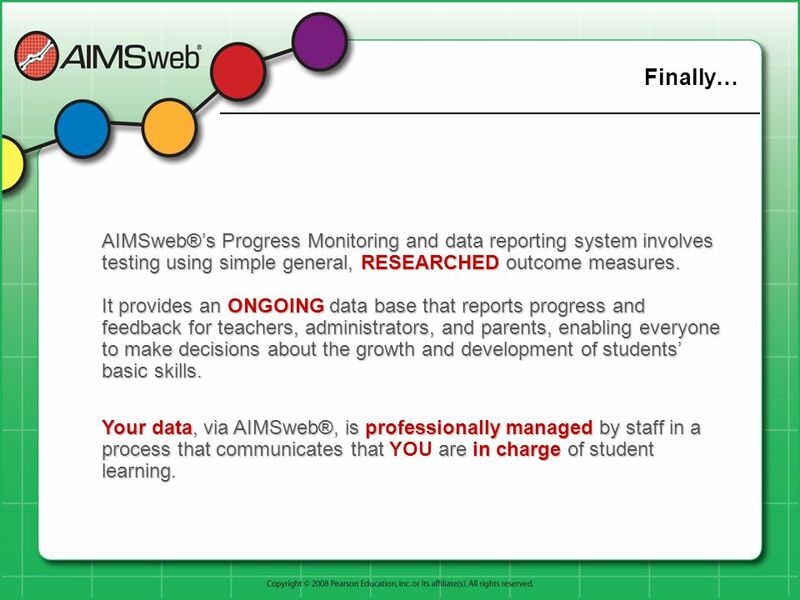 Your data, via AIMSweb®, is professionally managed by staff in a process that communicates that YOU are in charge of student learning. 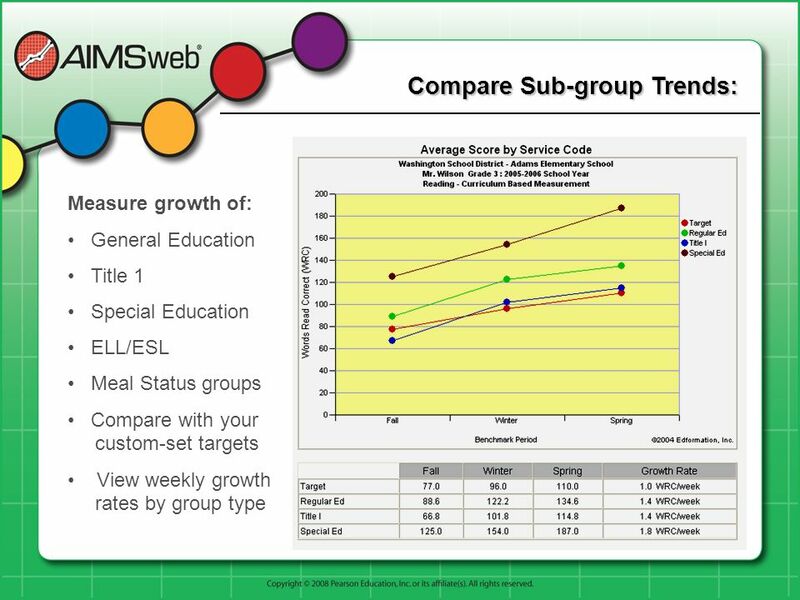 Download ppt "Overview of Curriculum-Based Measurement (CBM) and AIMSweb®"
Responsiveness to Instruction North Carolina Problem Solving Model Problem Solving Model Session 1/4. Overview Overview, history, and purpose of AIMSweb and Curriculum-Based Measurement AIMSweb and RTI Administration, Scoring, and Interpretation Oral Reading. Assessment and Tier III RtI Foundations Training June-September 2010 Erin Banks and Amy Roberts, School Psychologists. 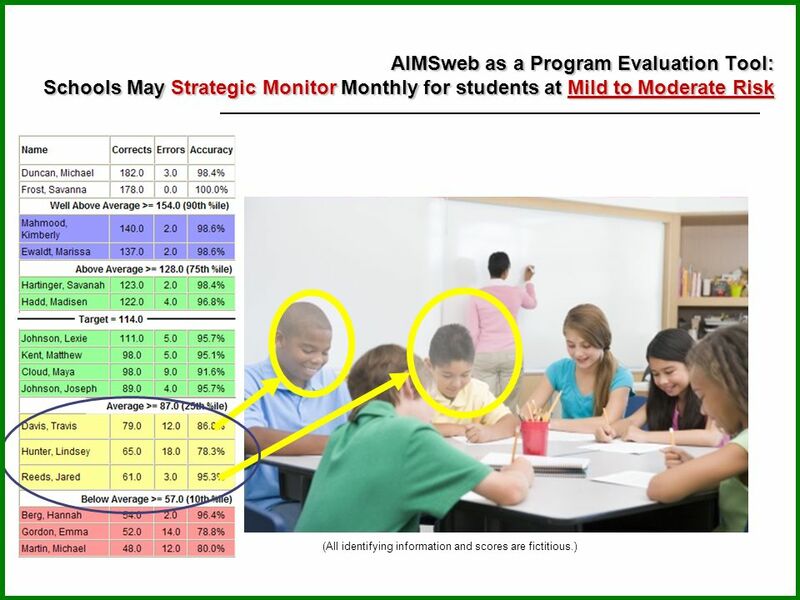 Measuring and Reporting Progress Toward Measurable Annual Goals Exceptional Children Division Policy, Monitoring, and Audit Section. RtI Case Studies RSS RtI Foundations Training August 2010 Amy Roberts & Erin Banks School Psychologists. 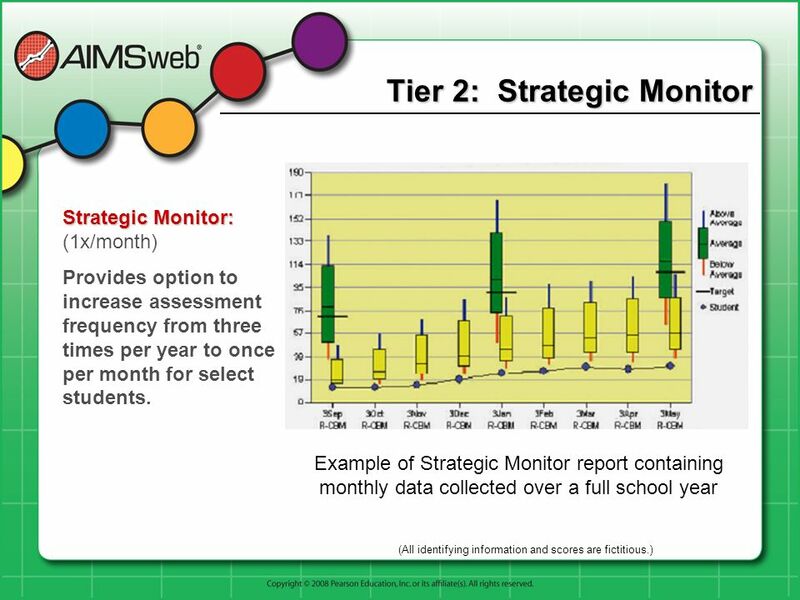 Academic Data for Instructional Decisions: Elementary Level Dr. Amy Lingo, Dr. Nicole Fenty, and Regina Hirn Project ABRI University of Louisville Project. Reading First Assessment Faculty Presentation. Fundamental Discoveries About How Children Learn to Read 1.Children who enter first grade weak in phonemic.